Positive Brexit headlines keep underpinning the Pound, BOE passed unnoticed. GBP/USD at six-week highs and biased higher. The Pound up roared to its highest in six weeks against the greenback on the back of dollar's weakness, as despite the BOE had a monetary policy meeting, the announcement hardly affected Sterling. The BOE left interest rates unchanged with the MPC voting unanimously. Policymakers now believe that Brexit uncertainty is now "greater." More relevant and probably the main reason the GBP/USD pair regained the 1.3100 level, was a news indicating that the UK has agreed to share certain information with the EU aimed to end the dispute over the Irish border dispute. And while the EU Commission clarified that they won't reconsider elements of the Brexit deal that are already approved, British Brexit Minister Raab, in an interview, said he was confident that the UK will get a good deal. Overall, Pound rallied on Brexit relief. This Friday, BOE's Governor Carney is due to speak at the Whitaker Lecture, in Dublin, with limited chances of saying something new on monetary policy. The GBP/USD pair consolidates around 1.3100, not far below a 1.3122 high. 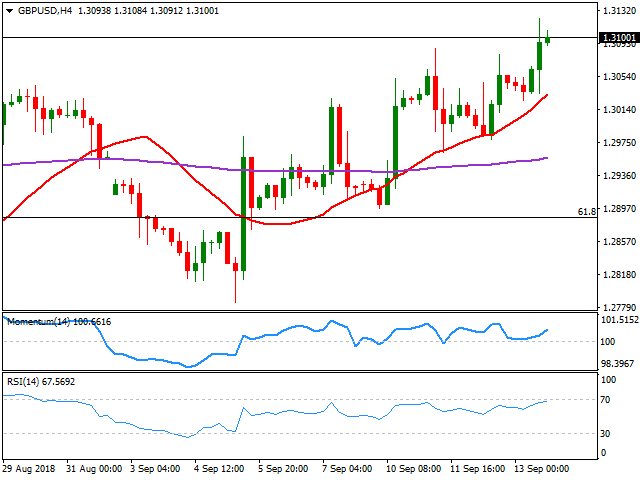 The pair is biased higher according to intraday technical readings, as in the 4 hours chart, an intraday retracement resulted in a sharp recovery once the price tested a bullish 20 SMA, currently at 1.3030. Technical indicators maintain their strong upward slopes well above their midlines, with the RSI nearing overbought readings. The pair still has room to extend its advance up to 1.3170, the 50% retracement of the 2016/18 rally.